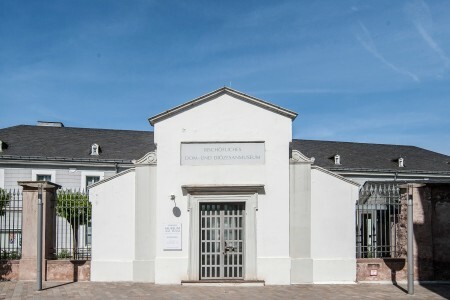 The modern light-filled museum was formerly a Prussian prison and displays, among other exhibits, works of Christian art and liturgical objects along with artifacts important in the history of the Church. The inventory is rich in sculptures, liturgical vestments, and altar furnishings. The coin and medallion collection encompasses primarily objects from the former Trier archdiocese. 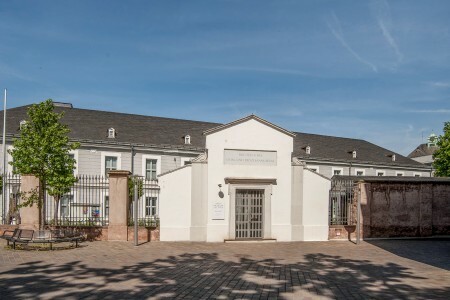 Trier’s ancient past is also reflected in the museum collection. After ten years of restoration work, the highly important Constantine ceiling paintings from the imperial palace and Cathedral are on view. 04/21/2019: 13:00 p.m. - 5:00 p.m.
04/22/2019: 13:00 p.m. - 5:00 p.m.
04/28/2019: 13:00 p.m. - 5:00 p.m. Closed ! 04/29/2019: 00:00 a.m. Closed ! 05/01/2019: 13:00 p.m. - 5:00 p.m.
05/05/2019: 13:00 p.m. - 5:00 p.m.
05/06/2019: 00:00 a.m. Closed ! 05/12/2019: 13:00 p.m. - 5:00 p.m.
05/13/2019: 00:00 a.m. Closed ! 05/19/2019: 13:00 p.m. - 5:00 p.m.
05/20/2019: 00:00 a.m. Closed ! 05/26/2019: 13:00 p.m. - 5:00 p.m.
05/27/2019: 00:00 a.m. Closed ! 05/30/2019: 13:00 p.m. - 5:00 p.m.
06/02/2019: 13:00 p.m. - 5:00 p.m.
06/03/2019: 00:00 a.m. Closed ! 06/09/2019: 13:00 p.m. - 5:00 p.m.